MacDaddy is this brilliant free application for MacOSX. What does it do? Well first off, don’t be fooled that the Mac part of the name has anything to do with Macs. It just runs on one. 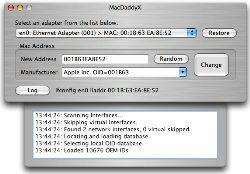 The second part is that it does have everything to do with MAC addresses which are hardware identifiers for network cards. What the program does for you is it spoofs the software driven MAC address (not the hardware side of things). This way, you can fool connections and protect yourself from actually putting your MAC out there for everyone to see. Reason why you don’t want to broadcast your MAC? Anyone that knows your MAC could basically sit on the network and sniff whatever comes to you just by spoofing your MAC. Crazy isn’t it.